The Collaborator Visual Studio Extension and Eclipse Plug-in do not support reviewing presentations. Use the Web Client instead. Collaborator adds native support for Microsoft PowerPoint (.ppt, .pptx, .pot, .potm, .potx, .pps, .ppsm, .ppsx, .pptm) and OpenDocument (.odp) presentations. To review presentations, just attach them to the review as you would any other file and when you open the Diff Viewer, the content area will display the presentation contents for review. Presentations can only be viewed in a single or side-by-side layout. To change presentation slides or pages, use the arrows at the bottom left of the comparison screen. The arrows will allow you to go to the Previous Page or the Next Page. You can also manually enter a page number and select Enter to jump to an arbitrary page. The page numbers will refer to the latest upload of the document shown. On the left of the main Diff Viewer page, there is a pane for chat threads, where you can view and make comments and mark defects that should be fixed. 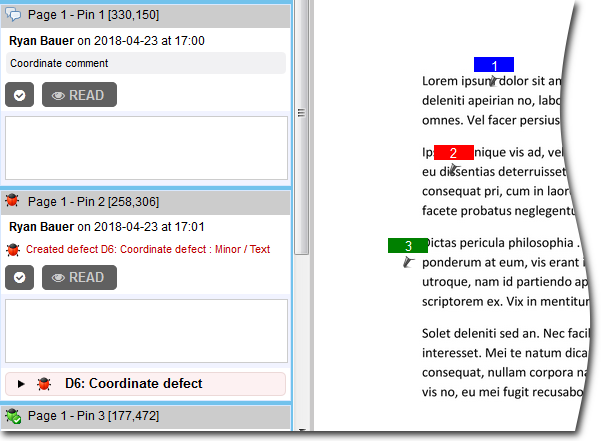 When reviewing presentations, you can create global, annotation, overall for file revision, coordinate (pushpin) and label comments and defects. To comment on specific text in a document, simply click the document at a point where you would like your comment to appear and begin typing. Collaborator will insert a pushpin ( ) to indicate the comment. The number in the pushpin head corresponds to the comment's order within the current page of the document. Alternatively, you may specify an arbitrary label, such as "Section 5.1", to describe the content you are referring to. Using labeled locations decreases the confusion that can occur when large changes occur in a text document resulting in the pushpins not being adjacent to the corresponding text. Label text may not be updated.